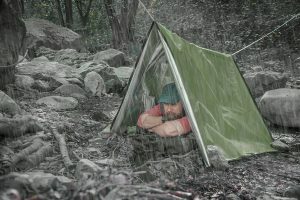 Unfortunately, obtaining a tent or other camping shelter that does not prompt reactions can be a challenging and frustrating endeavor for many of those individuals pursuing mold avoidance. 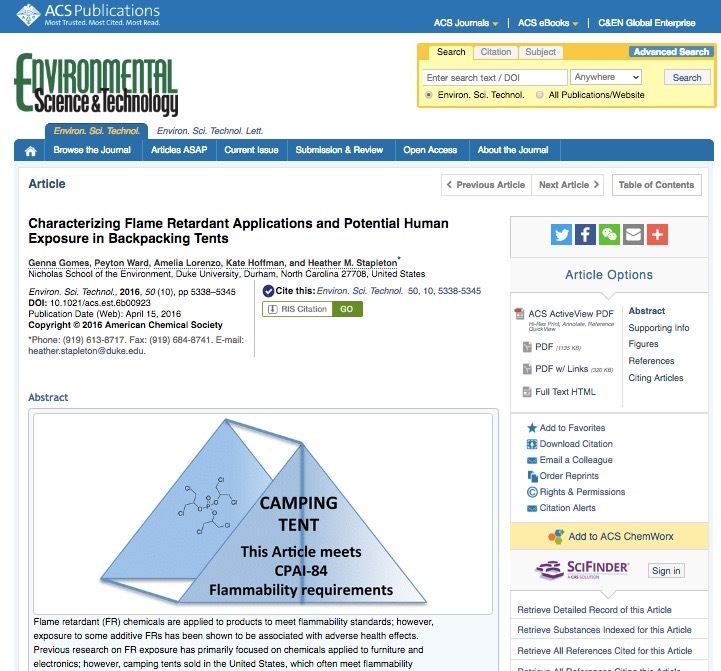 The biggest problem with tents seems to be their treatment with fire retardants, but other chemicals also may trigger sensitivities for some individuals on the front end. In addition, the synthetic fabrics in tents have the potential of becoming cross-contaminated with various environmental toxins. Mold – in some cases quite toxic mold – also may have the potential of growing on tents. In addition, tents (especially large tents) may be difficult or impossible to wash properly. 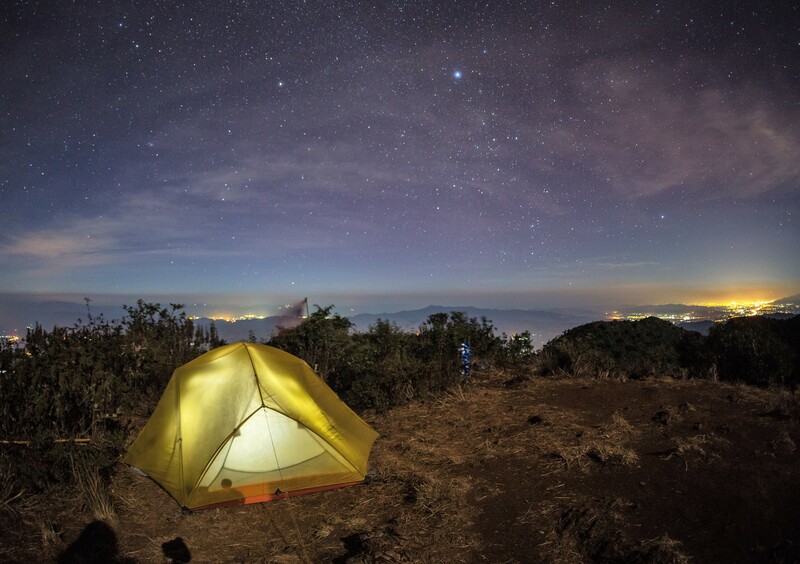 Many tents also are expensive, meaning that buying one and then not being able to tolerate it or losing it to an emergent problem can be a big financial loss. My experience with tents when I was first tent camping in 2009-2010 was that of the tents that I tried, REI and L.L. Bean tents were the closest to being tolerable for me right out of the box. Still, I found that I needed to rinse them in water and then to let them sit in the hot desert sun for at least a few weeks before they were usable for me. Some of the articles about dealing with fire retardants suggest that the chemicals possibly may be removed from fabric by washing them with the addition of a variety of different substances, such as soap or dishwashing detergent, vinegar, baking soda, or oxy-type cleaners. A major problem with tents and other shelters for those living in the U.S. is that certain states have enacted laws stating that these items must be saturated with fire retardant chemicals. 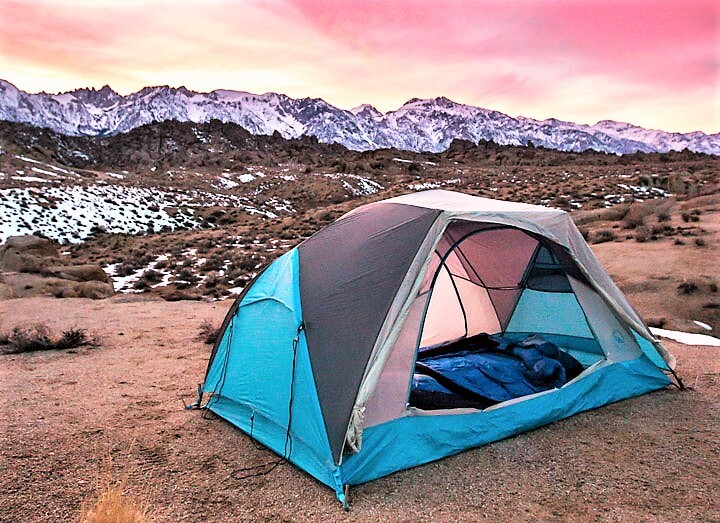 With almost no exceptions, tent manufacturers therefore treat all of their tents with these chemicals in order to be able to sell them in these states. While I am at the point where I am not bothered very much by most chemicals, fire retardants in certain tents still have a significant effect on me – to the point that there would be little point in my making a special effort to go out to the wilderness if I had to sleep in one of those tents. While not all mold avoiders are reactive to these kinds of chemicals, many of them are. Although fire retardants in mattresses as well as in camping shelters have become a source of concern to many people, getting laws mandating their use repealed has been remarkably difficult. However, it seems that manufacturers have a choice of which types of fire retardants to use, with some of the chemicals being much more toxic than others. I suspect that some companies choose to use the minimum amount of fire retardants required by law while others are much more liberal in the application of them as well. To my understanding, tents in Europe and in many other countries are not required by law to contain fire retardants. I think that a good business opportunity would be for an individual living in a state where no laws about fire retardants are on the books to import some of these tents and then to re-sell them to individuals with mold and chemical sensitivities at a significant markup. 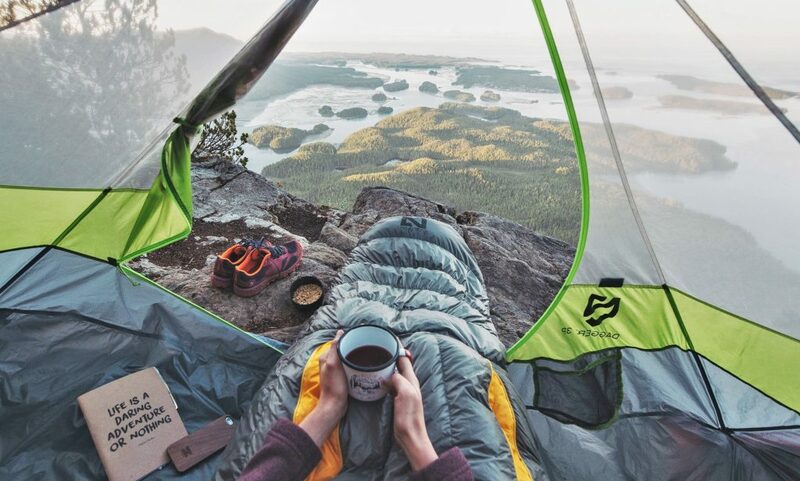 Of all the tent companies in the U.S., REI seems to have been the most proactive in investigating the problems associated with flame retardants and in communicating to consumers information about the topic. 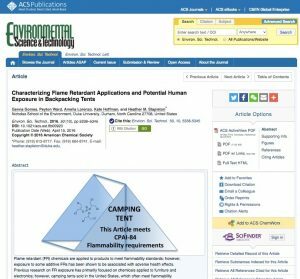 The company recently co-sponsored a study with researchers from Duke University on the topic of fire retardants in backpacking tents and then discussed the results with its customers in a blog article. REI managers state that, in accordance with state laws, the company uses fire retardants in all of its camping shelters. However, based on a variety of factors (my own experiences with their products, the reports that I have gotten from other mold avoiders, and their expressed concern about the issue), my feeling is that they are likely making an effort to use the safest chemicals and to use only a minimum amount of those chemicals. The following information was given to me regarding fire retardants used with our tents. They are treated with a Halogen Free Flame retardant additive. The product name is ICAPSIL FU5658- Please Note: No need to provide the name (alpha numeric of the treatment), as it has different names based on who the supplier is. Different MFG facilities use different suppliers of this same additive/treatment. This product is not Hazardous per the Globally Harmonized System of Classification and Labelling (GHS). The use of this product means that the tent meets All Prop 65 standards including CPAI-84. 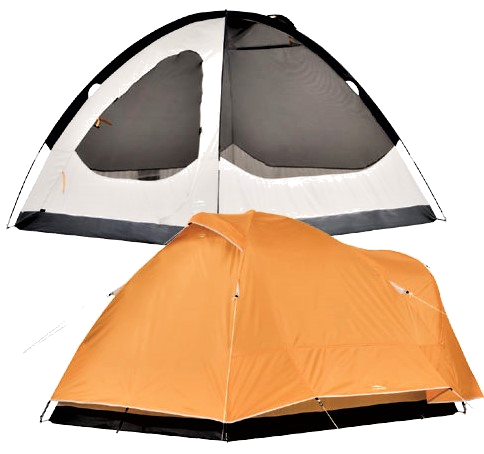 Unfortunately, my own queries and the reports that I have gotten from other mold avoiders who have pursued this issue suggest that other tent manufacturers seem to be more reluctant than either REI or L.L. Bean to share any information at all about their use of fire retardant chemicals in their products. In addition to the problem with the fire retardants, it is suspected by a number of mold avoiders that certain tent companies (including some in towns that are known or suspected to be hot spots for certain kinds of toxins) may have mold problems associated with their products. Waterproofing chemicals such as Teflon, offgassing from the synthetic materials and anti-microbial coatings also have been cited as problems by some mold avoiders. 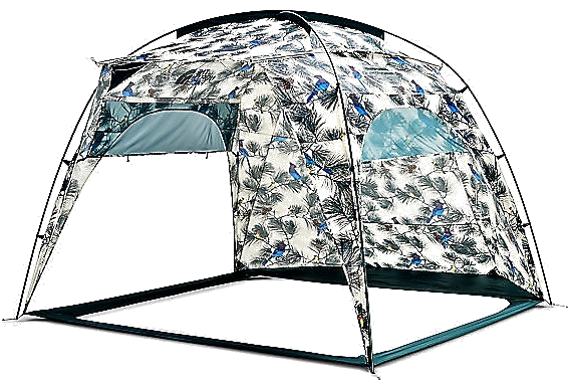 Mold growth on tents being used in certain outdoor problems also can become a problem on some kinds of tents. All of this is especially problematic considering that mold avoiders who are sleeping in tents need those tents to be especially clean since they will be breathing in whatever problematic substances are present for the entire night. An REI-sponsored study on the hazards of fire retardants in backpacking tents. An otherwise attractive tent that I gave up on. The disadvantage of this is that waterproofing chemicals may be removed along with the fire retardants. Recently I purchased via mail order a particular tent and it turned out to feel extremely toxic to me. I am guessing that this was related to a particularly bad type of fire retardant, but conceivably it could have been a mold problem in the Asian factory. Rinsing this tent in water alone did not seem to help very much. After I soaked it for a long time in water with oxy powder, and then overnight in water with several cups of vinegar mixed in, it did feel better to me, though still not enough that I wanted to sleep in it all night. So I gave up on it. 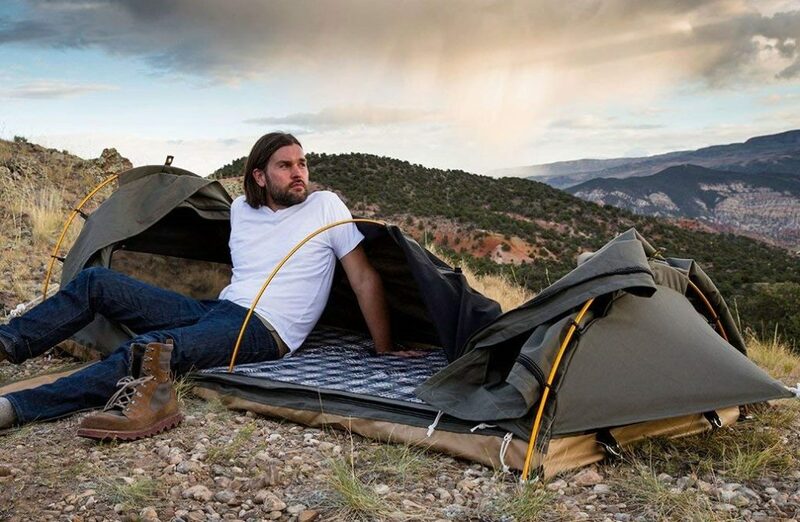 In general, if a tent seems more than a little problematic right out of the box, probably the best idea is to just send it back and try something else. Another problem that mold avoiders sometimes report is that mold (in some cases toxic mold) may grow underneath their tents during use. This seems much less likely to occur in good locations, to the point that if this happens on a regular basis, it may be taken to suggest that a change of location could be highly beneficial for reasons other than just avoiding mold growth on the tent. 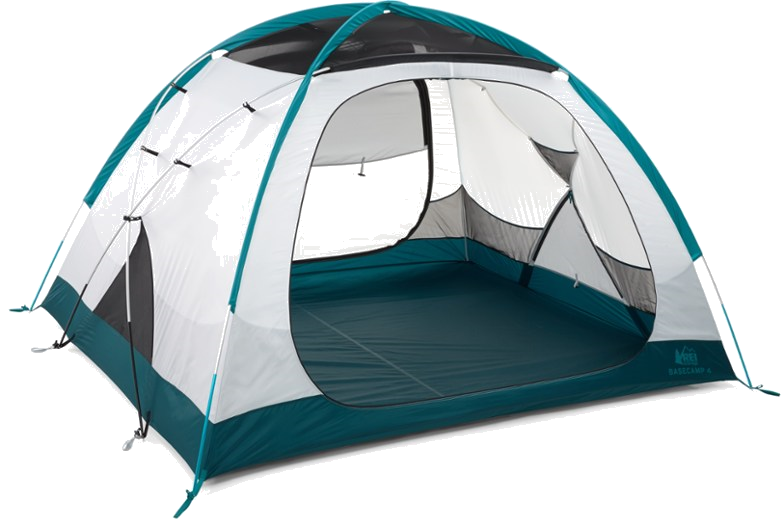 Otherwise, if it seems that there is a chance that mold growth may occur, then it may be a very good idea to take down the tent to let it air out during the day, rather than leaving it up continuously. 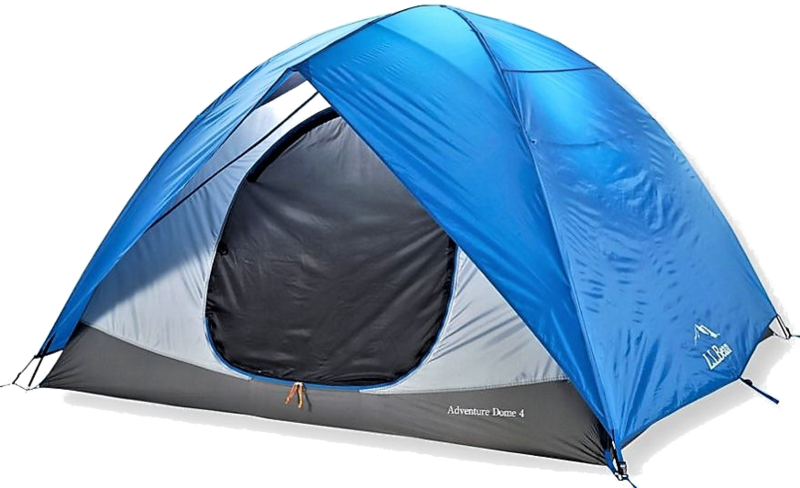 Exposing the tent – especially the bottom of the tent – to a short dose of ozone before putting it back up has been reported as additionally helpful by at least a few mold avoiders. I probably would put both the unit and the tent in a good sized box or plastic bin while running the ozone. 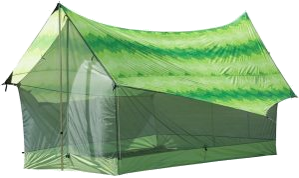 With this use of ozone, the goal is to kill spores that might turn into live mold in the dark moist environment under the tent, rather than to try to denature mold toxins. I therefore suspect that even an low-potency water ozonator such as the kind that I have used to extend the life of my fresh produce might be helpful. A higher-potency ozone machine also could be used, however. It is, however, very important to carefully avoid breathing in any ozone if it is going to be used, because it can cause damage to the lungs. Spraying the tent footprint and the bottom of the tent with a probiotic solution (such as EM1 or Homebiotic) or with essential oils (such as lemon, cinnamon, clove, thyme, oregano, rosemary or eucalyptus) also might be helpful at preventing mold growth in some cases. ACS – Is Tent Camping Hazardous? EM-1 Microbial Inoculant, 1 Quart. $35. Homebiotic Environmental Probiotic, 4 oz. $35. A2Z Ozone Aqua 6 Multipurpose Ozone Generator. $70. Forever Ozone OG-7000 Retro Style Ozone Generator. $100. Forever Ozone Cool-Tech 10,000 MGH Shock Treatment Ozone Generator. $130. The MoonLight Two Person Tent. 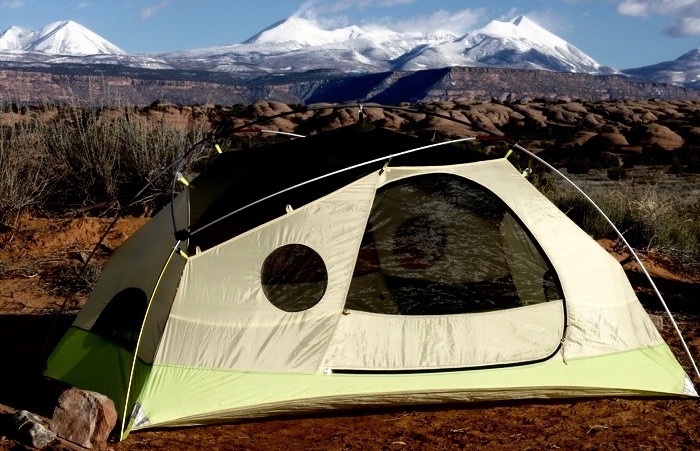 MoonLight is a line of tents made by a very small company located in Louisville, Colorado (near Boulder). The products are expensive but have gotten some good reviews from gear sites. 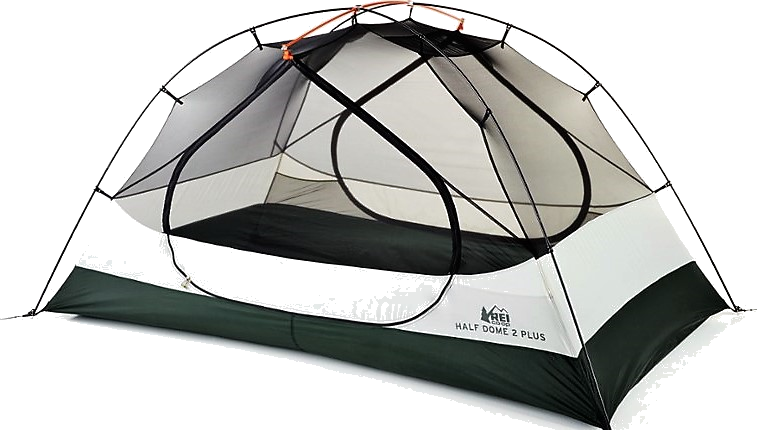 In addition, these are the only tents (other than the discontinued Sierra Designs Tensegrity Elite) that I have been able to find in the U.S. that are stated as not containing any fire retardants. They also do not use Teflon as water repellants. So far, so good. 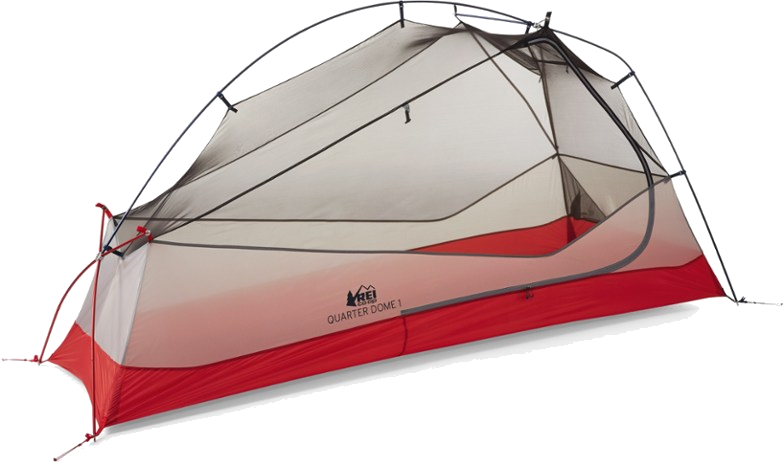 Unfortunately though, this company has a history of having mold problems with its tents – a problem that was mentioned as the only downside of the tents in a review by the Gear Institute. MoonLight discusses the mold issue on its website, stating that it believes that the problem has been addressed. However, since I have yet to hear any reports one way or the other about this line of tents from any mold avoiders that I trust, I still am feeling a little bit wary. In the company’s Facebook group, I asked the owner what seemed to have happened to cause the mold issue and also what would happen if a mold-sensitized person bought one of the MoonLight tents and was not able to tolerate it. I don’t think the reviewer or I know exactly how the mold came about. My best theory is that the supplier (who I don’t use any more) shipped the factory some contaminated goods – probably on the outside layers of the fabric roll – and that got made into the prototype that was reviewed. I doubt that the reviewer got the tent moldy but it’s theoretically possible. I can guarantee that no new tent has mold. I’ve evolved to accepting back new-condition tents that customers react to. It’s only happened a couple of times so it looks like a risk I can take. If any mold avoiders make a purchase from MoonLight, then I would like to hear how this turns out for them. The Sierra Designs Tesegrity Elite. 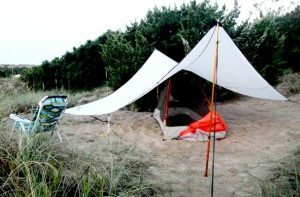 The Sierra Designs Tensegrity Elite is a very small and compact backpacking tent that requires hiking poles (which I do always have with me) for its setup. I am looking forward to putting it up outdoors when the weather gets a bit warmer. I was intrigued by rumors that the Sierra Designs Tensegrity Elite (now discontinued) does not contain any fire retardant chemicals and so decided to order this tent to give it a try after finding it at a good price ($277) on Amazon. Although the tent that I received smelled faintly of some kind of perfume (an issue that resolved itself quickly once the tent was out of the bag), I had absolutely no reaction to it and feel really good about it. Sierra Designs Tensegrity Elite 1 (Amazon). $400. Sierra Designs Tensegrity Elite 1 (Moosejaw). $400. Sierra Designs Tensegrity Elite 1 (Mountain Steals). $400. Sierra Designs Tesegrity Elite 1 (Sunny Sports). $400. Sierra Designs Tensegrity Elite 2 (Amazon). $490. A view from inside the Nemo Dagger Tent. For many years, the only tent that I ever came across that felt good to me right out of the box was the REI Half Dome. The Half Dome is a small tent suitable for backpacking that is made almost entirely of mesh, and I always felt perfectly fine in it without needing to wash it at all. Although I have rarely used the rainfly, that has felt fairly good to me as well. Quite a few other mold avoiders also have reported doing well with the REI Half Dome, and I’ve yet to hear from anyone who has been wholly unable to tolerate it. I recently purchased the 2017 Half Dome during a holiday sale (for about $130) and am happy to report that it feels good to me. 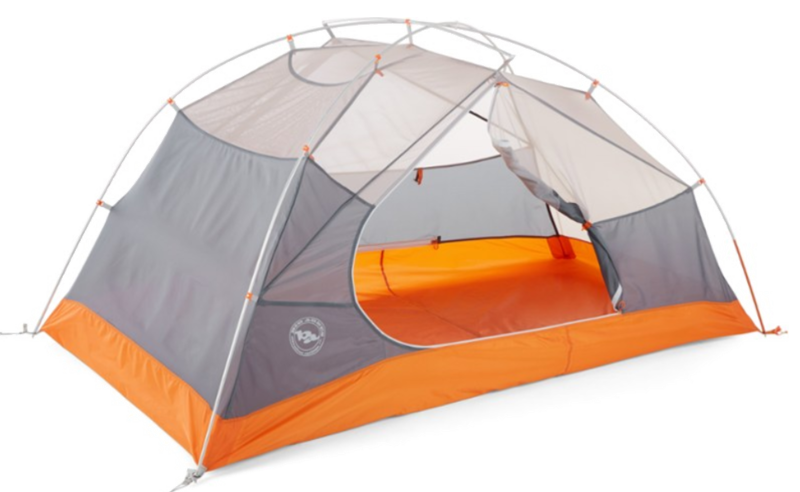 The REI Half Dome 2 Plus Tent. The 2018 Half Dome is a little roomier and (based on my quick evaluation while in the REI store) also feels good.The REI Quarter Dome tents are somewhat lighter weight and little more compact than the Half Dome series. They are at a much higher price point, and I am not sure that the weight savings would be worth it for car camping (although it very well might be for backpacking). 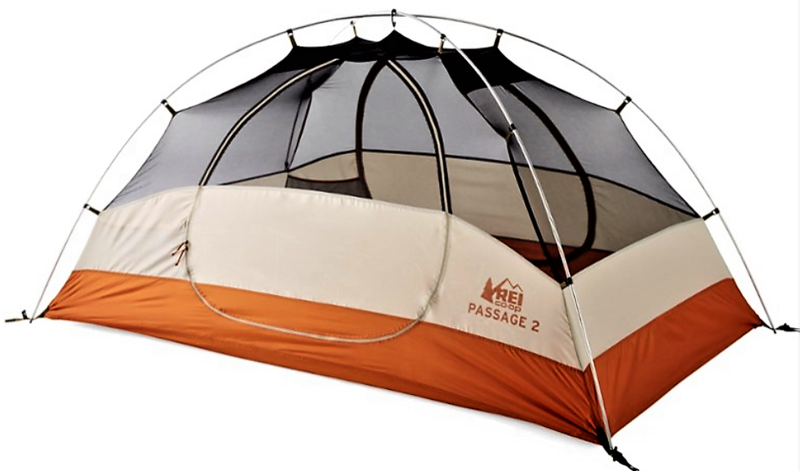 The REI Passage 2 Tent. Based on having quickly checked them out in the REI store, I would guess that in terms of lack of toxicity they are about the same as the REI Half Dome tents. The REI Quarter Dome 1. Also in the REI store, I tried setting up the Nemo Galaxi tent and sat inside it for a while. It seemed extremely similar to the REI Half Dome to me, in terms of its feeling okay to me with regard to toxicity issues as well as with regard to its all-mesh construction, its size and its price point. I would not hesitate to purchase and use it. 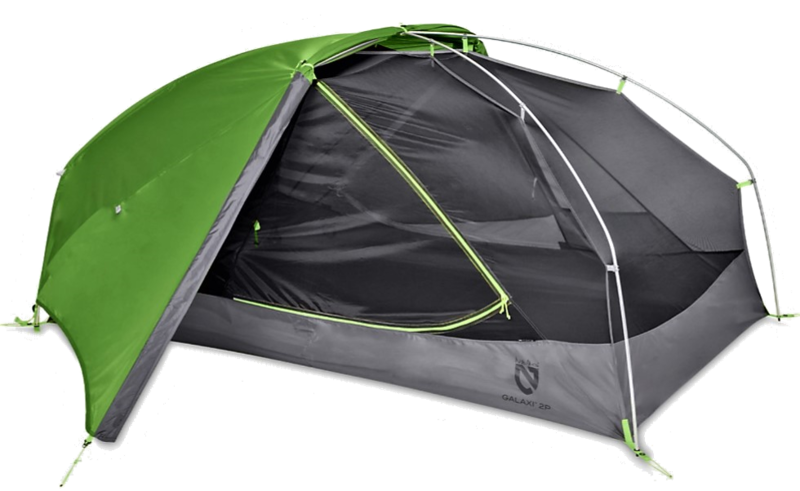 Nemo also sells many very lightweight backpacking tents, and I had a chance to quickly check out the Nemo Hornet at the REI store. It felt about the same to me as the Nemo Galaxi, and so my guess would be that all of their tents are similar in terms of being relatively acceptable with regard to toxicity issues. The Big Agnes Frying Pan SL2 Tent. The L.L. Bean Mountain Light Tent. Moving on, I’ve purchased a couple of L.L. Bean tents over the years and have felt they were fairly okay with regard to the fire retardant issue but not as good as the tents previously described in this section. The L.L. Bean Mountain Light and L.L. 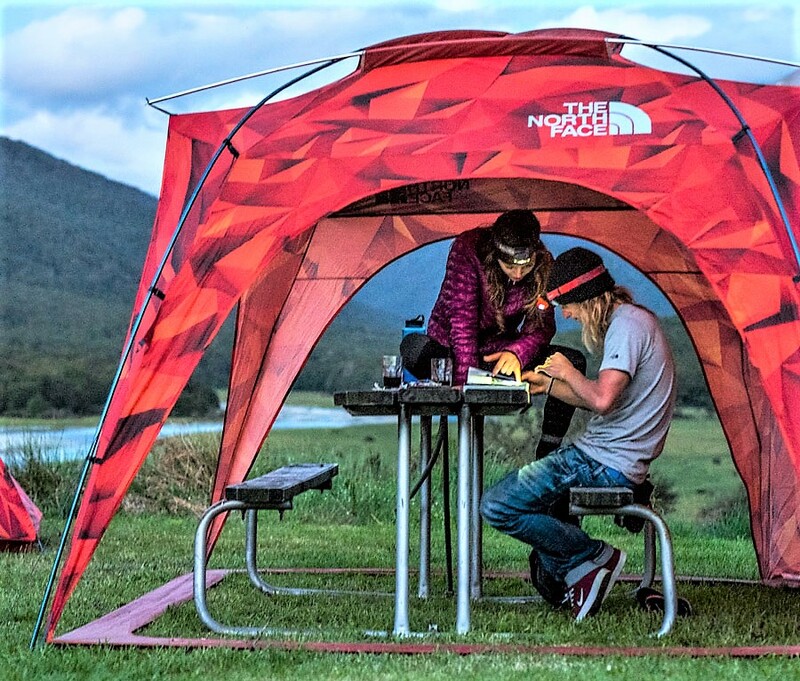 Bean Microlight UL backpacking tents – which are virtually entirely made of mesh and which I have not tried yet – may be especially worth checking out. The Coleman Hooligan 3 Tent (with and without rainfly). 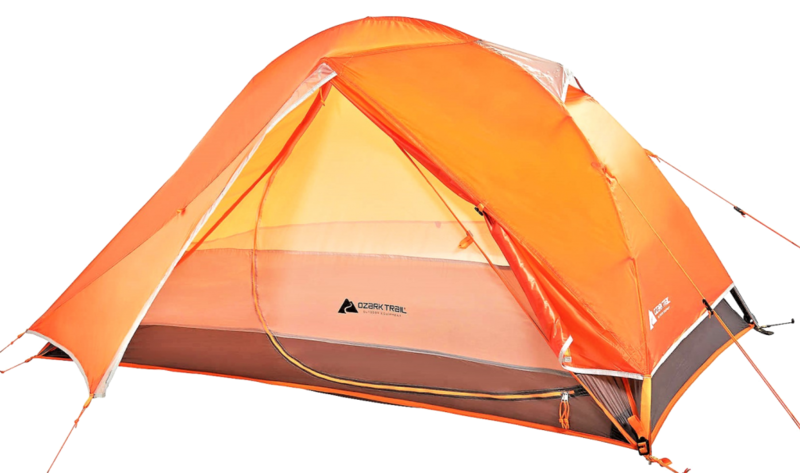 The Ozark Trail Ultralight Backpacking Tent. I’ve heard one or two positive reports from mold avoiders about Tarptents and so would be interested in trying those as well. Nemo Galaxi, 2 person (Amazon). $250. Nemo Galaxi, 2 person (Moosejaw). $250. Nemo Galaxi, 3 person (Amazon). $300. Nemo Galaxi, 3 person (Moosejaw). $300. Big Agnes Blacktail (Amazon). $240-330. Big Agnes Blacktail (Moosejaw). $240-330. Big Agnes Frying Pan (REI). $250-300. Big Agnes Tufly (Amazon). $400. L.L. Bean Mountain Light Tent. $269-289. L.L. Bean Microlight UL Backpacking Tents. $299-349. 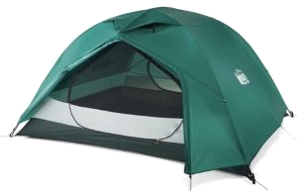 Ozark Trail Hiker Tent. $30. 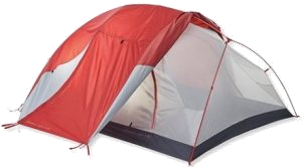 Ozark Trail 43 Ounce Ultralight Backpacking Tent. $55. The Coleman Moraine Park Dome Tent. Tents that are designed for car camping tend to be heavier, bulkier and less expensive (for their size and features) than backpacking tents. They usually contain less mesh and more solid fabric, which could be good for those who value privacy but which also results in less ventilation than I would prefer even if fire retardants were not an issue. The REI Camp Dome 2. The first tent that I purchased (back in 2008) was the REI Camp Dome 4 Tent, and I used it full-time for many months. The REI Base Camp 4. It was inexpensive for its size and very easy to put up, but it took several weeks before it stopped triggering reactions once I got unmasked. I remember sleeping on a picnic table in southern New Mexico at one point because I didn’t want to be exposed to the tent, for instance. 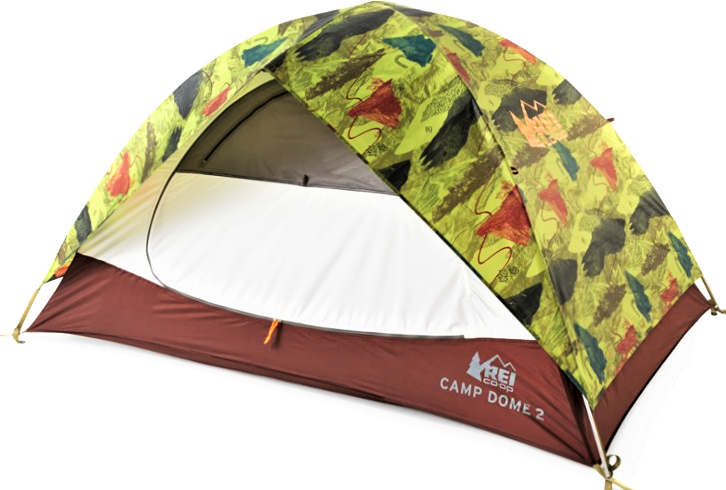 The REI Camp Dome car camping tents continue to be inexpensive, relatively roomy and easy to assemble. Although reports suggest that they still may not be as clean right out of the box as the REI Half Dome tents, they nonetheless could be a good choice for those who are new to camping and don’t want to spend too much money on equipment, or for those who want a somewhat larger tent. 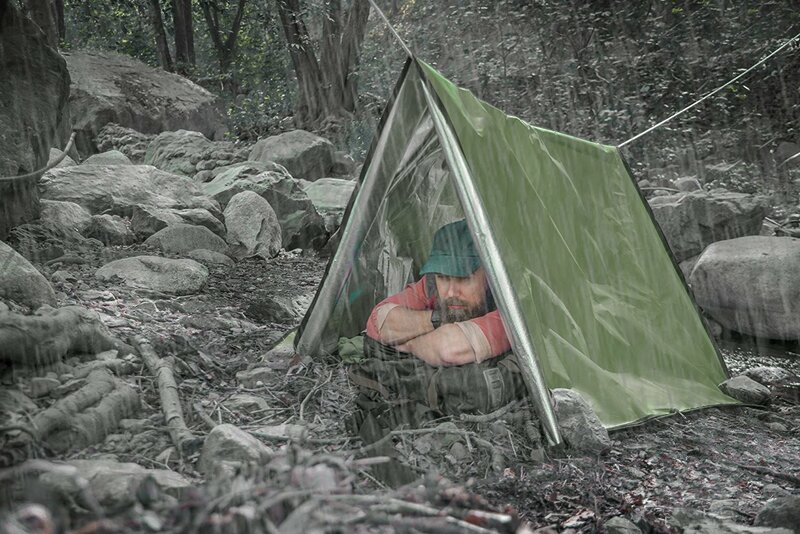 The REI Base Camp tents also have received some scattered positive reports from mold avoiders. The Big Agnes Big House 4 Tent. I have known several mold avoiders who have done well with some larger Big Agnes tents – such as their Big House – pretty much right after purchasing them. I owned an L.L. Bean Adventure Dome for a while when I was very reactive, and it was okay for me after it sat out in the desert sun for a few weeks. Eventually I moved on from it in favor of a tent with a greater level of ventilation, however. The L.L. Bean Adventure Dome 4. I also owned a larger L.L. Bean tent with a screen room for a while, and it worked out about the same as the Adventure Dome – that is, that after a few weeks in the desert sun, it felt okay for me but didn’t have as much ventilation as I would have preferred. 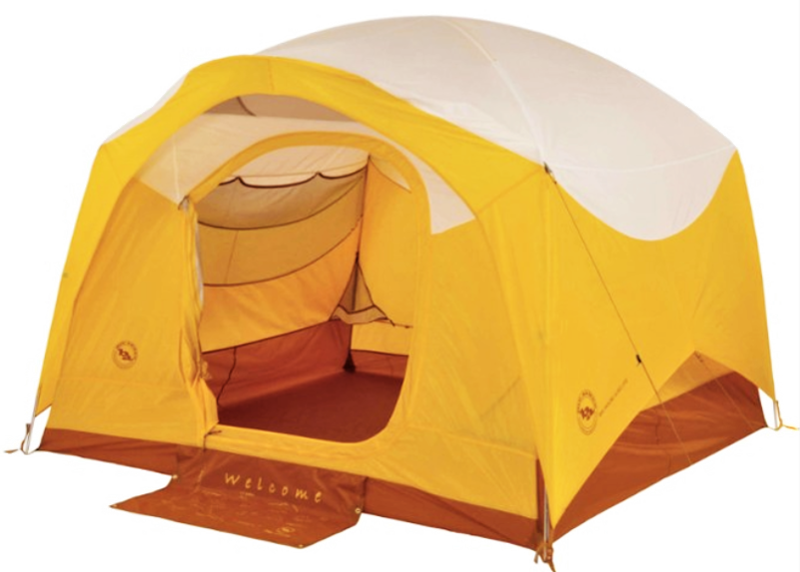 The Coleman Sundome 4-Person Tent. My experiences are consistent with reports that I have gotten about L.L. Bean tents from other mold avoiders – that in terms of toxicity issues, they are better than many products but still may present some problems. A Big Agnes backpacking tent that was on display at an REI store recently felt okay to me. Although Big Agnes products seem to me a bit on the pricey side, they could be an option to consider, therefore. 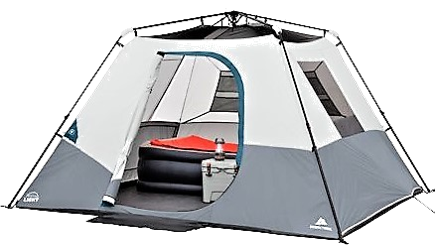 The Walmart Ozark Trail 6-Person Instant Cabin Tent. Some additional brands that have at least occasionally been reported as being tolerable by those with severe mold or chemical sensitivities include PahaQue Wilderness, Lightspeed Outdoors, Wenzel, Kodiak Canvas, Ohuhu, Coleman and Walmart Ozark Trail. REI Camp Dome Tent. $100-200. 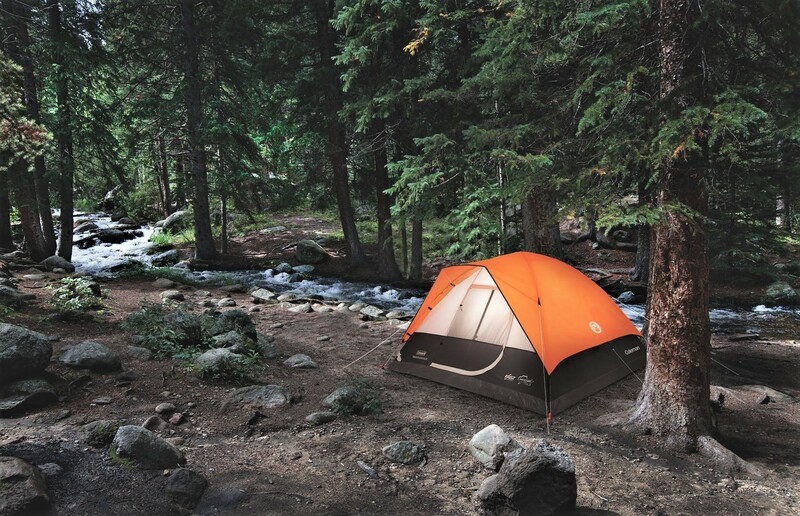 REI Base Camp Tent. $369-429. Big Agnes Big House 4 (Amazon). $300. Big Agnes Tents (Amazon). $270. L.L. Bean Adventure Dome Tent. $169-299. Coleman Sundome Tents (Amazon). $70-150. Coleman Sundome Tents (Walmart). $70-150. Coleman Moraine Park Fast Pitch Dome (Amazon). $130. Ozark Trail Instant Cabin, 6 person. $99. The Springbar Highlne 6 Canvas Tent. The Kodiak Canvas Swag Tent. 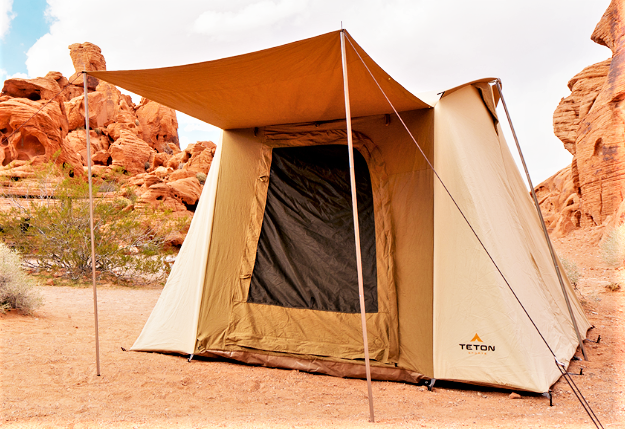 The Teton Sports 4-Person Canvas Tent. Kodiak Canvas Swag Tent, 1 Person (Amazon). $300. Kodiak Canvas Flex-Bow Tent, 4 Person (Amazon). $550. Springbar Compact 2 Tent. $380. Springbar Outfitter 3 Tent. $480. Springbar Vagabond 4 Tent. $550. Springbar Highland 6 Tent. $600. Springbar Highline 6 Tent (Amazon). $600. Springbar Campsite 4 Tent. $630. Springbar Traveler 5 Tent. $760. 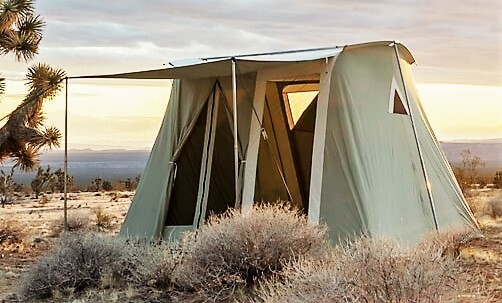 Teton Sports Canvas Tent, $488. Otter Wax Fabric & Canvas Wax. $20. The Kamp-Rite Double Tent Cot. I’ve had a few positive reports from mold avoiders about Kamp-Rite Tent Cots, which serve as a combination of a tent and a cot. Rumor has it the tent cots sold by Cabela’s are made by Kamp-Rite, and so I was glad to have a chance to try out the Cabela’ s Deluxe Single Tent Cot during a recent visit to one of their stores. Although not all of the Cabela’s tents that were on display that day felt good to me, I really liked the way that this tent cot felt and spent a good bit of time lying in it. I think that I could sleep quite comfortably in it, from the perspectives of both comfort and lack of toxicity. 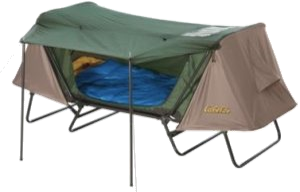 The Cabela’s tent cot seems quite similar in terms of design and size to the Kamp-Rite Oversize Tent Cot, but with a few added features. 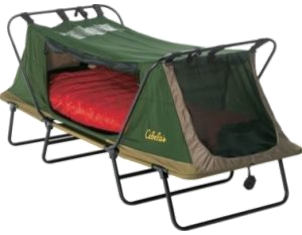 The Cabelas Single Tent Cot. For instance, it offers the ability to extend the door to the cot into an awning with included poles; has a plastic window on the ceiling to allow stars to be viewed at night; and has cupholders and other interior organization features. 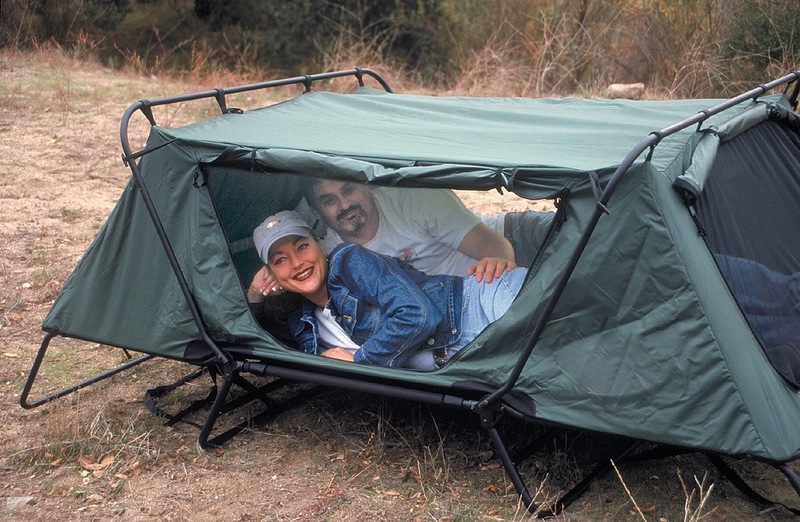 The length of the Cabela’s tent cot is 88″. Considering that I am only 5’3″, that means that there is a very large amount of foot of the tent cot for me. The width (32″) was quite roomy for me well. Although I don’t think there would be enough extra room in the tent cot for another adult (especially since the weight limit is 300 pounds), I certainly think that I could co-sleep comfortably in this tent cot with a child or a pretty large dog. The Kamp-Rite Original Tent Cot is more my size and also considerably smaller when packed up for travel purposes. However, that model has only two legs (rather than the four legs offered in the Cabela’s moel and the Kamp-Rite Oversize Model). I’ve read a few complaints that the Kamp-Rite original model does not feel all that sturdy and sometimes can even tip over. In looking at the pictures of it, I definitely can see how that would be. 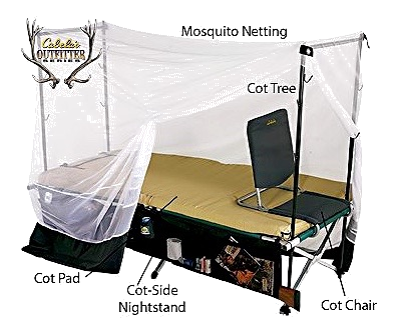 The Cabela’s Single Tent Cot with rain fly awning extended. 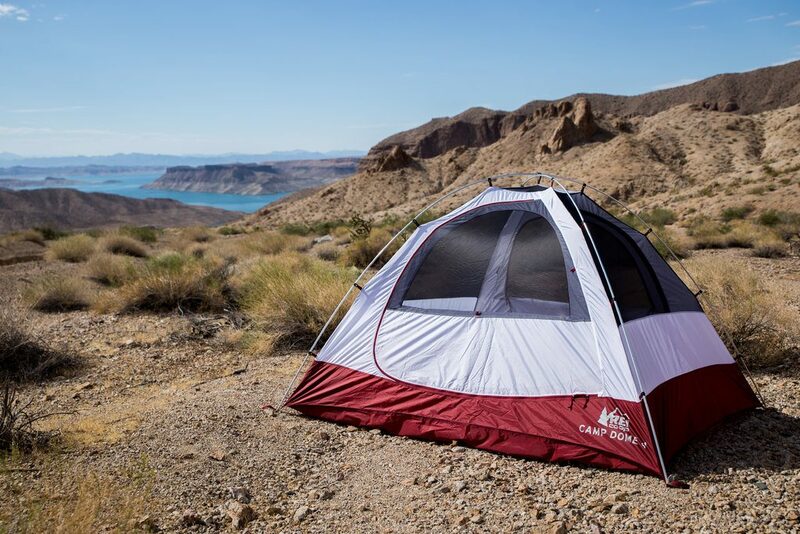 On the other hand, the Cabela’s model felt super-solid – to the point that I think that it would do much better with high-speed desert winds than any tents that I have ever used. That could be a real advantage of the larger tent cots compared camping in a regular tent, especially in the desert Southwest where wind can be really strong, I think. The interior height of all these tent cots is about 24″, which means that even a short person is not able to fully sit up inside. However, all four sides of the tent cot that I tried could be opened entirely to the elements as well as with the use of fine mesh. At least for me, this kept the tent cot from feeling unpleasant or restrictive. I do think that if it were entirely closed up – and especially if the optional rainfly were being used – spending time in the tent cot could start to feel pretty closed in and also cause a great deal of condensation to build up. The Kamp-Rite Original Tent Cot. I therefore think that if the tent cot were going to be used when it was raining, it might be better to have it positioned under a large tarp or other large shelter (such as an awning or on a porch), rather than to plan to use the rainfly. Another issue with these cot tents is that while I thought they take up even more room in the vehicle than does the Coleman ComfortSmart Cot that I have been carrying around (in some cases considerably more). Coleman ComfortSmart Cot: 34″x24″x6″; 18 pounds. Coleman Deluxe ComfortSmart Cot: 40″x31″x5″; 20 pounds. Kamp-Rite Original Tent Cot: 35″x31″x6″; 24 pounds. Kamp-Rite Oversize Tent Cot: 36″x34″x7″; 32 pounds. Cabela’s Deluxe Single Tent Cot: 36″x35″x9″; 39 pounds. Cabela’s Double Tent Cot: 57″x37″x8″; 56 pounds. 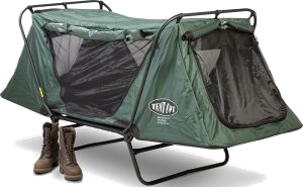 Although I really like the Cabela’s tent cot that I tried, it is on the large and heavy side compared to the smaller Kamp-Rite brand cots (as well as my Coleman cot). The other problem with these cots is that I don’t think that they would be usable just as a cot in my van, since the tent part is not detachable. The Kamp-Rite Collapsible Tent Cot. That makes me a little interested in the Kamp-Rite Collapsible Tent Cots, since those products can be used just as a tent, or just as a cot, as well as a tent cot. I’m a little skeptical about these tent cots though, mostly because the legs look pretty spindly and not really sufficient for their intended purpose. In addition, even the standard version when unfolded is 79″ long, which would be a tight squeeze for use in my cargo van. The Kamp-Rite Collapsible Tent Cots fold up into a different shape than the regular tent cots (more long and narrow similar to a bag chair). Cabela’s Single Tent Cot (88″x32″x36″). $280. Cabela’s Double Tent Cot (88″x53″x36″). $380. Kamp-Rite Original Size Tent Cot (84″x28″x35″). $170. Kamp-Rite Oversize Tent Cot (90″x32″x36″). $220. Kamp-Rite Double Tent Cot (84″x53″x40″). $300. Kamp-Rite Standard Compact Tent Cot (79″x29″x57″). $160. Kamp-Rite XL Compact Tent Cot (84″x33″x61″). $170. Kamp-Rite Double Compact Tent Cot (85″x55″x59″). $270. The Crazy Creek Crazy Crib LEX. I think that hammocks could be a great idea for mold avoiders, since they seem to have the potential of offering a great deal of access to fresh air (i.e. without it being filtered through material saturated with toxic chemicals) and also allowing toxins that are breathed out to easily dissipate. 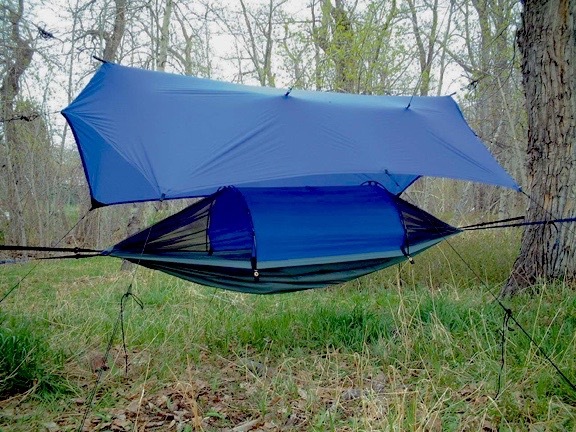 Conceivably rain protection could be provided by setting up the hammock underneath a tarp. Bug protection could be provided through mosquito netting (which is readily available without fire retardants). Although I have spent some nights sleeping on picnic tables in order to get as much fresh air as possible, I have never used a hammock for the same reason that I have so little experience using tarps – that is, that the trees that are typically used to support these items are not usually available in the desert. While it is theoretically possible to set up a hammock using poles, this seems like it would take a goodly amount of effort and that the whole setup would take up a large amount of room in the car. 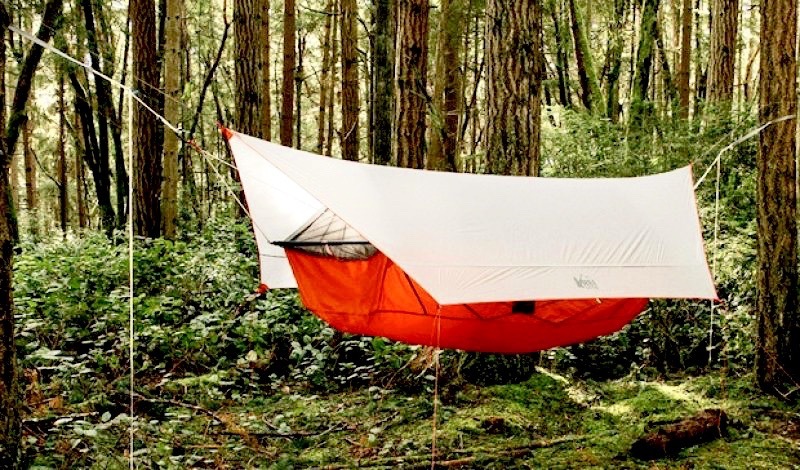 The REI Quarter Dome Hammock. If I were looking to buy a hammock, the first thing that I would likely do would be to head to an REI store to check out the REI Quarter Dome Air Hammock. The reason is that I have had so much success with REI Half Dome Tents feeling okay to me that my hope would be that this hammock would be tolerable for me also. However, in looking at the user reviews of the Quarter Dome Hammock, I also like the idea that it seems simple to sleep either with or without the bug net and that everything seems set up to make assembly fast and easy. I also see that last year’s model (which is stated by the REI representative in the Q&A’s as being little different than this year’s) is on sale for $150. If I knew for sure that I would have a good place to hang this hammock on my travels, I would give it a try. REI also sells a second house-brand hammock – the REI Co-op Flash Air Hammock – that I would look at closely if I were in the market for a hammock. One experienced mold avoider recommended the Crazy Creek Crazy Crib hammock, and so I might be interested in looking at it as well. Another hammock that seems designed just for relaxing rather than sleeping is the Nemo Cloudview Portable Camp Hammock. I still would be interested in looking at it if I knew I was going to have a place to hang a hammock though, because I felt good about the Nemo tents I tried recently. I’d be interested in hearing some reports from other mold avoiders who have tried using hammocks. REI Flash Air Hammock. $200. REI Quarter Dome Air Hammock. $220. Crazy Creek Crazy Crib LEX. $199. Nemo Cloudview Lite Hammock (Moosejaw). $130. Nemo Cloudview Portable Hammock (Amazon). $180. Nemo Cloudview Portable Hammock (Moosejaw). $180. Kim Goodwin’s Homemade Tyvek Tent. 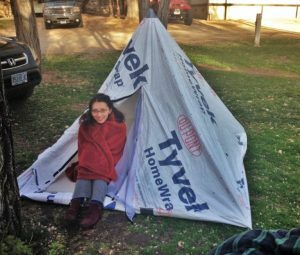 Getting away from the idea of using commercial tents at all, Kim Goodwin’s idea of sewing a simple tent out of Tyvek is an interesting one, since that material is waterproof but free of fire retardants as well as certain other problematic chemicals. Kim was severely reactive to various chemicals and to mold toxicity at the time that she used this tent, and said that it was nevertheless okay for her. She reports that the tent cost about $100 in materials and that it was pretty easy for her to sew. I think that ideally, we would find seamstress or tailor living in a state such as Colorado where fire retardants are not required in camping shelters to make tents like this, so that people would not have to make the tents themselves or find someone to make them. Thinking about tent cots made me wonder about whether it would be possible to convert a regular cot into a tent cot. Fortuitously, I happened upon while shopping something called the Cabela’s Cot Tree. The product can be attached to the ends of a regular cot, creating a high “headboard” and “footboard” – thereby providing the potential for mosquito netting to be draped over the tent. With the addition of a tarp to protect against rain and to provide some privacy, I think this could be a pretty comfortable setup for those mold avoiders who are especially reactive (or who just would prefer to avoid spending a lot of money on an expensive tent). 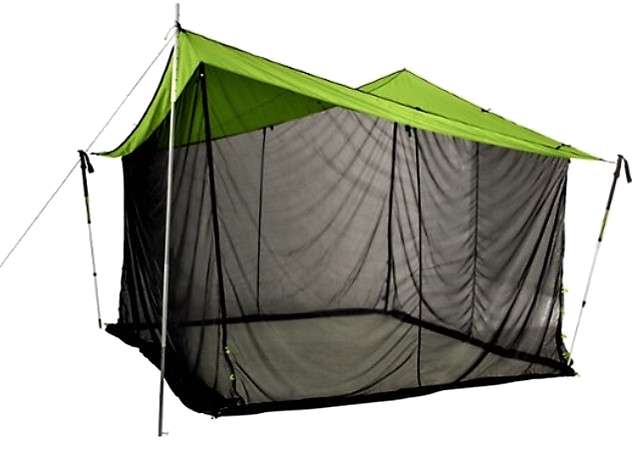 Even better, this setup would be fairly inexpensive compared to the cost of buying an costly REI or Nemo tent, since the Cabela’s Cot Tree is only $20 and since both mosquito netting and tarps can be purchased very inexpensively as well. And as a bonus, the cot tree could serve as a drying rack for socks or other small items after I washed them by hand. Hopefully the Cabela’s store nearest me has these cot trees in stock so that I can get a better sense of whether they will work for this purpose when I visit the store soon. The 10′ x 10′ Coleman Instant Screenroom. One of the camping amenities that I appreciated the most was the little screen room that was incorporated into one of my L.L. Bean tents. That screen room seemed to bring a lot of civilization to my campsite, giving me a place to socialize, read, work on my computer and eat in an area that was shaded from the sun, protected from mild rain, and relatively free of bugs. Although L.L. Bean still makes a large screen room tent, I wouldn’t really suggest that people starting out with avoidance consider buying it. It is much too large and difficult to wash, as well as quite expensive. In addition, the sleeping area does not have very much ventilation, and the stored tent would take up a great deal of room in the vehicle. The Walmart Ozark Trail Instant Screen House. I do think that a smaller screen room could be a really good thing for people who are doing a camping sabbatical, however. The Clam Quick Set Traveler Shelter. 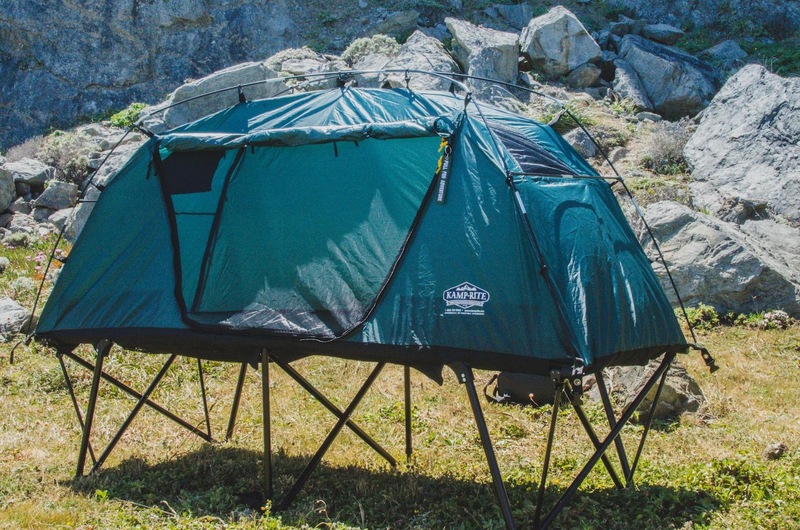 It would be especially great if the smaller Coleman Instant Screenhouse would work, since it is very affordable (recently available on Amazon for less than $70) and takes almost no effort to put up. The problem is that as is the case with tents, screen rooms are required by law in many states to contain fire retardants and that the Coleman shelter would be difficult to decontaminate thoroughly since it is a “pop-up” style with the fabric permanently attached to the poles. I have heard mixed reviews from mold avoiders with regard to Coleman tents as well as Coleman screenhouses. When I stopped by a store recently to check out the Coleman Instant Screenhouse, I thought that it seemed like it was reasonably okay but that it was hard to know for sure since the store did not feel that great to me to begin with. At some point I would like to try putting one up outdoors to see what I think of it. The smaller version of the Cabela’s Copper River Screenhouse is also pretty reasonably priced ($99). I wish I could take a look at it. The King Camp Quick Up Screen House is not very tall (only 53″), but I think that it still might have potential as a sitting room as well as a sleeping tent if it turned out to be okay on the toxicity front. 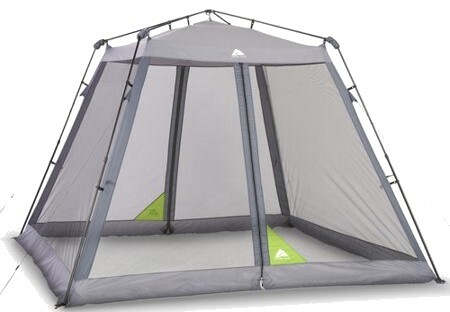 I also would like to look at the REI Co-op Screen House Shelter, since (based on reports from other mold avoiders and on my own positive experiences with REI tents) it seems to have the most potential for being tolerable with regard to toxicity issues. Unfortunately, it is also quite expensive ($250) and seems like it may be rather difficult to put up. The L.L. Bean Woodlands Screen House also might be a possibility worth trying out. The L.L. Bean Woodlands Screenhouse. The Luxe Tempo and the Roaraima screen houses also look like they might have some potential if they were to turn out to be non-toxic enough to be tolerable. An issue with all these screenhouses is that they are pretty bulky when in their stored positions. I therefore would need to be pretty convinced that I was going to be getting a good bit of use out of one of these shelters to make it worthwhile to carry it around in my van. Hopefully some people will try some of these screen rooms (or other screen rooms) and then report back on which ones work or don’t work for them, with regard to both toxicity issues as well as other issues. Coleman Instant Screenhouse, 10′ x 10′ (Amazon). $120. Coleman Instant Screenhouse, 15′ x 13′ (Amazon). $160. Coleman Mountain View Screendome Shelter (Amazon). $210. 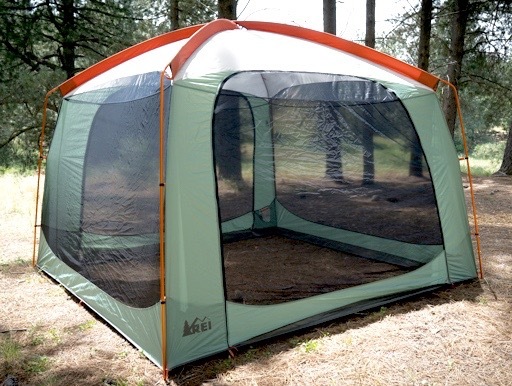 REI Screen House Shelter, 10’x10′. $250. LL Bean Woodlands Screen House, 10’x10′. $289. 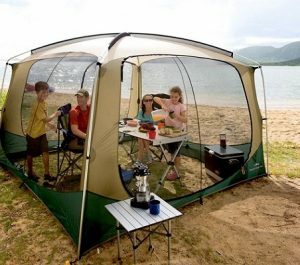 Walmart Ozark Trail Screen House, 13’x9′. $39. Walmart Ozark Trail Instant Screen House, 10’x10′. $83. Clam Quick Set Traveler Shelter (Amazon), 6″ x 6″. $220. Clam Quick Set Escape Shelter (Amazon), 12’x12′. $261. Clam Shelter Wind Panels (Amazon). $55. Roraima Screen House, 13’x9′. $90. KingCamp Quick Up Screen House, 7’x7′. $100. 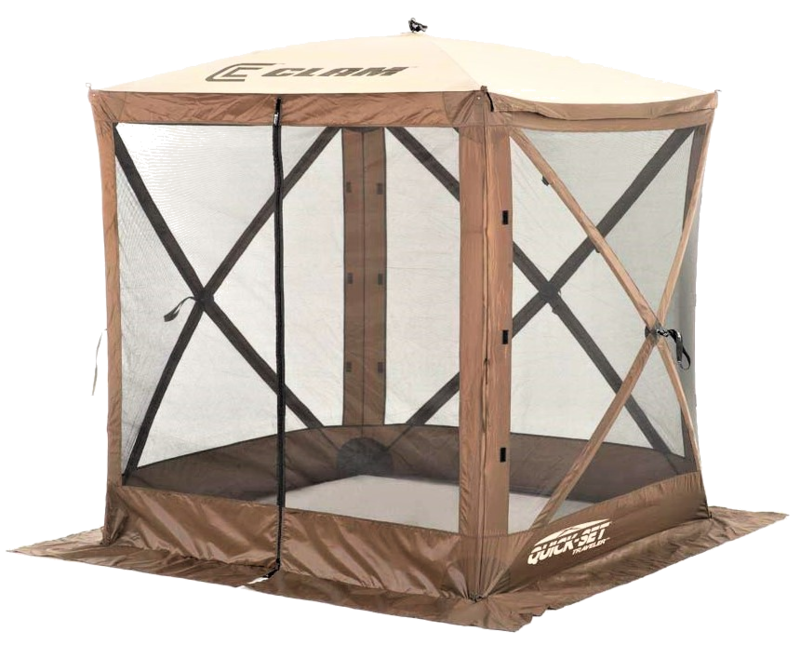 Cabela’s Copper River Screenhouse, 12’x10′. $100. Luxe Tempo Screen House Tent, 7’x7′. $119. Gazelle Pop-Up 4-Sided Gazebo, 10’x10′. $178. The Coleman Day Tripper Beach Shade. For those who are less ambitious and just want a little bit of protection from the sun, a company called Lightspeed manufactures a wide range of smaller pop-up shade shelters. For instance, the Lightspeed Outdoors Tripod Instant Canopy (at 75″ high) is the tallest of the bunch and is currently priced at $56 on Amazon. The Lightspeed Tripod Instant Canopy. It appears to be the exact same item (though in a different color) as the L.L. 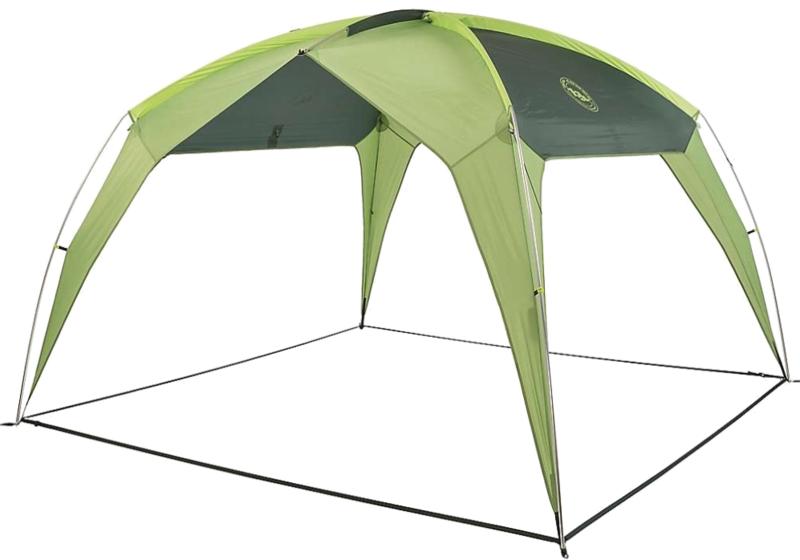 Bean Traverse Packlite Easy Pitch Shelter being sold for more than twice the price. Conceivably the shelters could differ substantially in terms of the types and amounts of fire retardants that were used on them though. The Ozark Trail Instant Sun Shade. 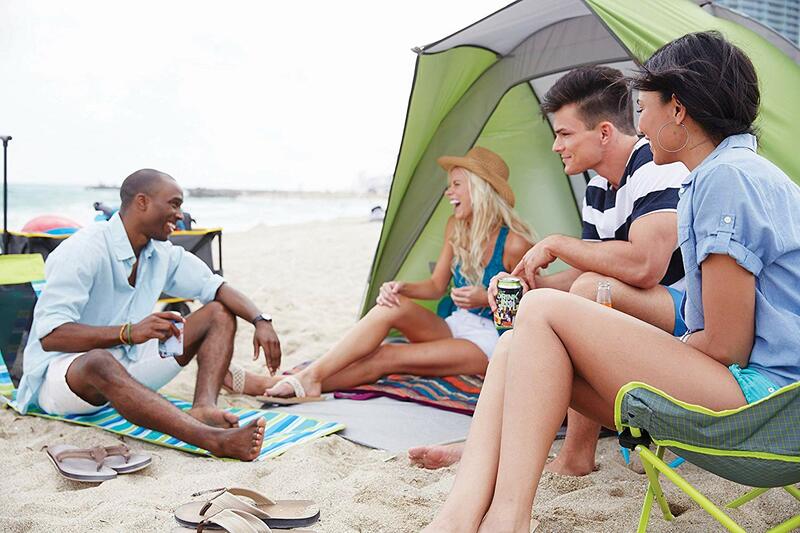 The Pacific Breeze Easy Setup Beach Tent – available through Amazon Prime for $100 – also seems that it could be worth a look. The Nemo is the smallest and the least rain-resistant, but my very positive recent experiences with Nemo sleeping bags and a Nemo tent in terms of toxicity issues make me want to give it a try. 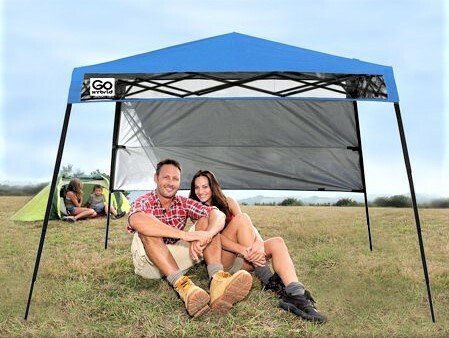 The Quick Shade Go Hybrid Instant Canopy. Lightspeed Tripod Instant Canopy (Amazon). $56. Lightspeed Tall Canopy (Amazon). $90. Lightspeed Quick Canopy Instant Pop Up Shade Tent (Amazon). $99. 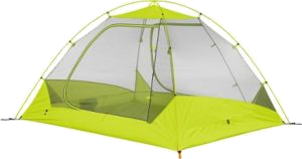 Lightspeed XL Sport Shelter Instant Pop Up (Amazon). $139. Coleman DayTripper Beach Shade. $60. 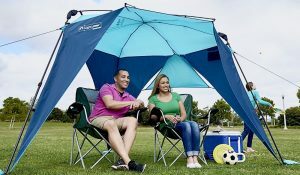 Ozark Trail Instant Sun Shade (Blue), 8’x8′. $59. Ozark Trail Instant Sun Shade (Gray), 8’x8′. $59. 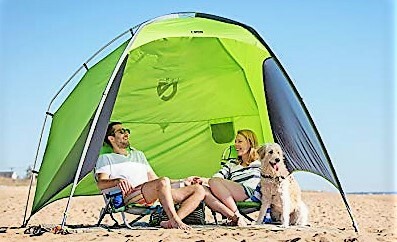 Pacific Breeze Easy Setup Beach Tent, Deluxe XL. $100. 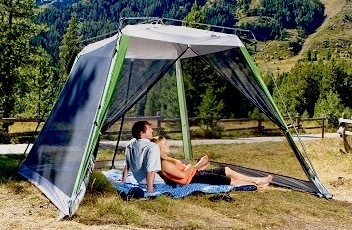 Quick Shade Go Hybrid Instant Canopy, 7’x7′. $80. Big Agnes Whetstone Shelter (Amazon). $140-180. Big Agnes Whetstone Shelter (Moosejaw). $140-180. Nemo Victory Sunshade (Amazon). $200. Nemo Victory Sunshade (Moosejaw). $200. Nemo Victory Sunshade (REI). $200. LL Bean Sunbuster Folding Shelter. $129. LL Bean Traverse PackLite Easy-Pitch Shelter. $149. The North Face Homestead Shelter. Shade shelters tend to be a little less potentially problematic from a toxicity standpoint than screen rooms, because they are more open and get more fresh air circulation without that air being filtered through possibly toxic mesh. The Big Agnes Three Forks Shelter. In addition, many of these shelters have fabric that is separate from the poles, meaning that the material can be washed more easily and thoroughly. The downside to these structures is that they do not have insect protection. The L.L. Bean Woodlands Shelter. In many cases mosquito netting (which is not required by state laws to be treated with fire retardants) may be hung from the shelter if insects are a problem, however. One shelter that interests me is The North Face Homestead Shelter. It is quite tall (110 sf, 81″), which is not necessarily a plus in terms of ease of putting it up. The reviews suggest that it is well-made and likely to be durable, but it also is relatively expensive ($300). 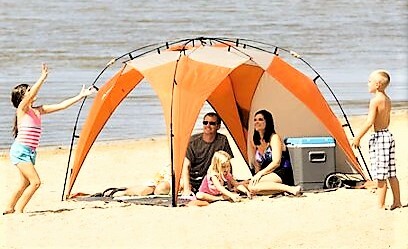 In looking at shade shelters online, a few of them – the (81″ tall), (78″ tall) and the Nemo Victory Sunshade (72″ tall) – seem to have some potential. 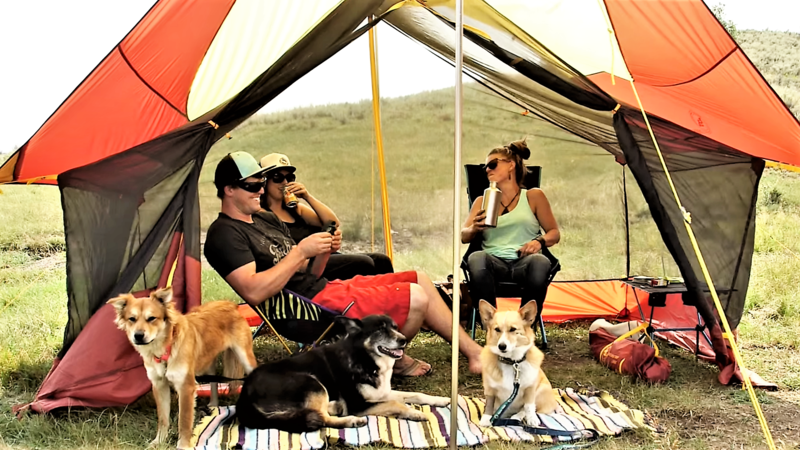 is made by a company based in Steamboat Springs, Colorado, and is a fairly popular shade shelter. It is 78″ tall. I have known some mold avoiders who have done well with Big Agnes tents and so this one could be worth a try. It seems from some of the customer reviews that durability possibly may be an issue with it though. and I see online that I could get last year’s model of their shade shelter (yellow and red) at the time of this writing at a good discount. The L.L. Bean Woodlands shelter (81″ tall) also seems to have some potential, although reviews suggest that it may be a little difficult to put up. Big Agnes Three Forks Shelter (Amazon). $200. Big Agnes Three Forks Shelter (REI). $200. Big Agnes Three Forks Shelter (Moosejaw). $200. Big Agnes Three Forks Shelter Accessory Wall (Website). $25. LL Bean Woodlands Shelter. $200. The North Face Homestead Shelter (Moosejaw). $299. The North Face Homestead Shelter (REI). $299. The Big Agnes Deep Creek Tarp and Bug House. In the past, I have purchased some inexpensive plastic tarps (of the sort that are widely available at many different retail outlets), mostly to spread on the ground or to cover my belongings after I have removed them from the car. I have almost no experience with putting up tarps as shelters though, due to the fact that I have mostly camped in the desert. Tarps are much more difficult to use when large trees are not readily available, and the lack of significant amounts of rain in the desert makes the use of tarps less important there than they might be elsewhere. What I recently realized about tarps, though, is that they seem to be exempt from regulations mandating the use of fire retardants in other kinds of camping shelters. That makes figuring out how to use them effectively much more appealing to me. In addition, tarps can be considerably less bulky to carry around than other kinds of shade shelters. Especially when space is at a premium, that can be very important. Properly using tarps seems to be an art that may take some effort to learn. I would like to take an in-person or online class in the topic, I think. At minimum, figuring out how to use tarps rather than a rainfly to protect my tent from rain seems like it could be really helpful in increasing air flow and comfort. A couple of manufacturers make tarp-based shelters designed for backpacking expeditions that look particularly interesting. I have spent a considerable amount of time watching and re-watching the video for the Big Agnes Deep Creek Tarp and Bug House system, for instance. I think that this shelter would be ideal if I could make it work, since it would not take up very much room in the car and would give me the flexibility to use just the tarp or to also use the insect shelter. I also think it’s really important that both the tarp and the netting could be washed easily, since they are not attached to poles. However, I fear that a shelter like this would take a considerable amount of time to put up and wonder if I could get it up at all even with the help of another (unexperienced) person, much less on my own. I do think that if I could make it work, and assuming that the toxicity situation of the product was okay, it might be ideal with regard to meeting my own needs and being useful for others though. A somewhat similar product is the Nemo Bugout Tent, which is designed primarily to be tied to two trees in the wilderness. Supposedly tarp poles purchased separately also could be used, although I have my doubts about how easy this would be based on the reviews that I have read. Although it may be the case that this shelter has been treated with fire retardants, based on my experience with the Nemo Galaxi tent, I tend to think that it nonetheless might be okay for me from a toxicity standpoint. Finding the right place to hang it up while car camping could be a big challenge though. Nemo Bugout Tent (Amazon). $200-250. Nemo Bugout Tent (Moosejaw). $200-250. Nemo Bugout Tent (REI). $200. Big Agnes Deep Creek Shelter (Amazon). $200-250. Big Agnes Deep Creek Shelter Accessory – Bug House (Amazon). $150-170. Big Agnes Deep Creek Shelter (Moosejaw). $200-250. Big Agnes Deep Creek Shelter Accessory – Bug House (Moosejaw). $150-170. The Survival Series Thermal Reflective Waterproof Blanket. Recently I purchased a Survival Series Thermal Reflective Waterproof Blanket via Amazon. I like it because one side is reflective silver (useful for keeping things cool in sunny weather) and the other side is a muted khaki-type green (rather than bright blue or some other obtrusive color). It feels okay to me, though it did require a day or two of sitting out to off-gas the plastic. I probably will purchase at least one more of these. The Grabber MPI Space Blanket/Tarp looks similar, but (at least as currently listed on Amazon) is available only in brighter colors. 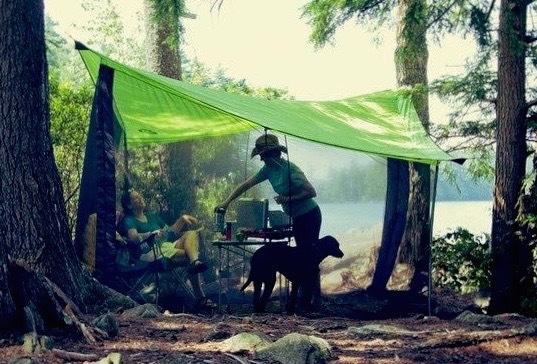 If I can figure out how to use a tarp as shelter for my campsite or my tent, I might invest in some nicer ones as well. The grayish-white ones by REI looked beautiful in the store, for instance. The L.L. Bean Multi-Use Tarp/Shelter also seems intriguing, although the online description makes it unclear exactly how it would work. Maybe eventually a reviewer will provide an explanation. A customer photo of a 12′ REI tarp being used as a tent shelter. REI Co-Op Camp Tarp. $60-100. LL Bean Multi-Use Tarp/Shelter. $159. Arcturus All-Weather Survival Blanket. $20. Grabber MPI Space All Weather Blanket/Tarp. $20. Survival Series Thermal Reflective Waterproof Blanket. $25. REI Co-Op Adjustable Tarp Pole (Single). $30-35. 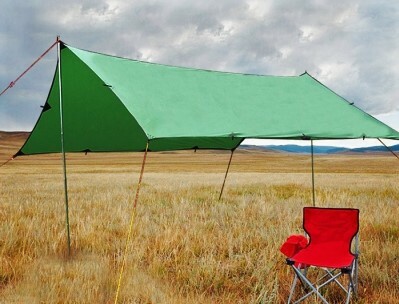 Green Elephant Adjustable Aluminum Tarp and Tent Poles (Set of Two). $45. 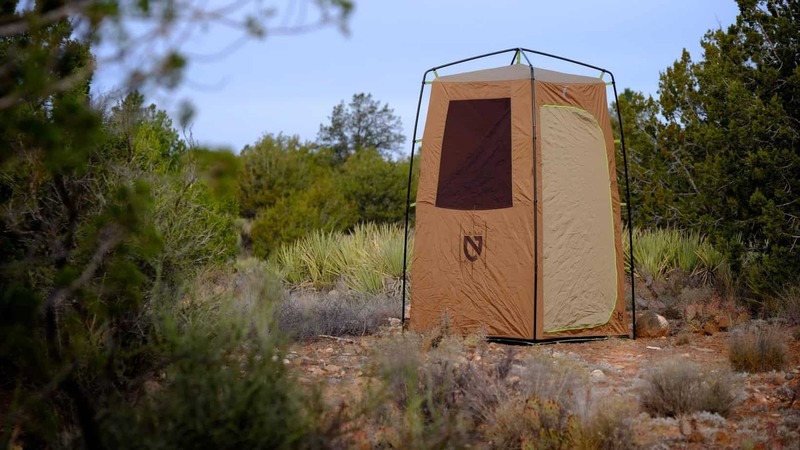 Although I briefly owned a privacy shelter (a large one from Cabela’s) early in my camping experience, it took up so much room in the car and was so much trouble to put up that I soon gave it away. I mostly stayed in hot springs or other campgrounds with shower facilities while I was tent camping, and then after that I just used the bathroom in my RV. The Lightspeed Outdoors Privacy Tent. 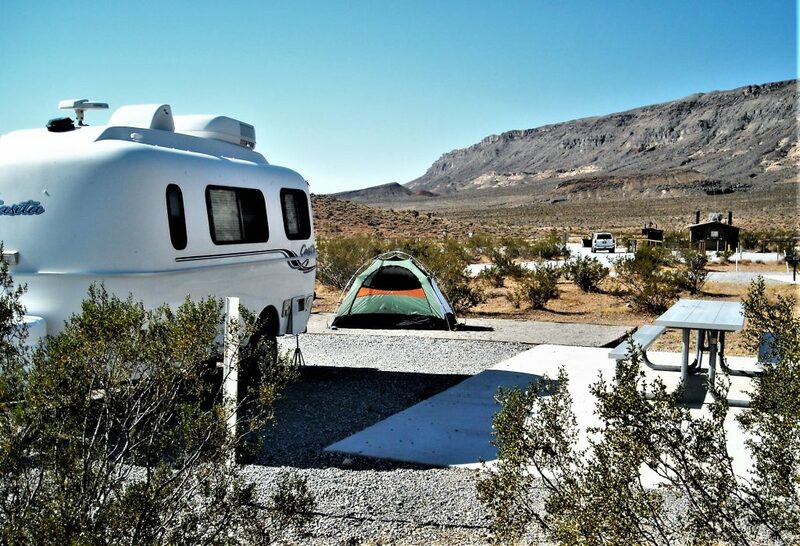 However, many more people are camping off-grid these days, due in large part to encountering problems with campground and RV park septic systems. A privacy shelter that sets up quickly and easily – and that preferably takes up very little room in the car – thus may come in handy for both showering for toilet facilities. A new style of shelter that I do not recall seeing in the past seems to fold down super-compactly and to pop up into a full-size shelter pretty easily. 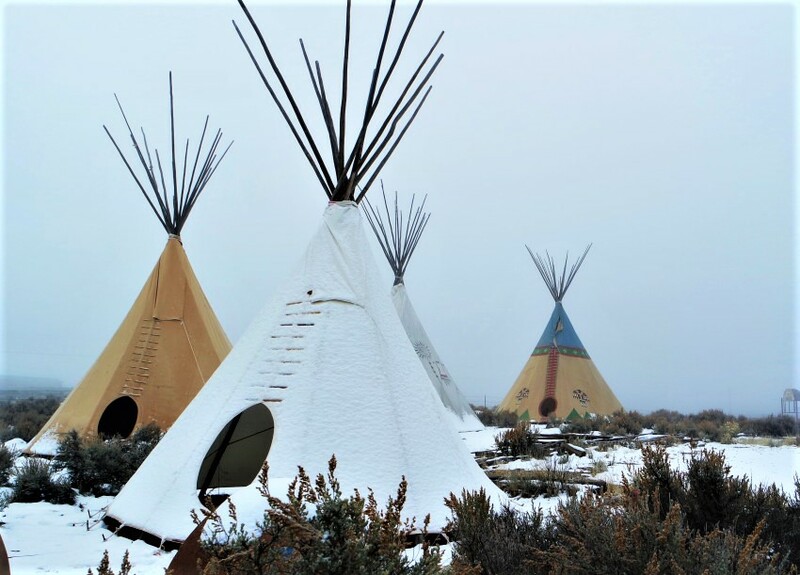 Quite a few companies – including Wolfwise, KingCamp, Green Elephant, Partysaving and Copper River – sell this kinds of shelter. Whether some of these shelters are better than others, I’m not sure. In reading the reviews, it looks like the main challenge with these shelters is that that there is a little trick to getting them to fold back up again. Cabela’s (which sells the Copper River version) created a video on the topic that I thought was especially informative, and so hopefully if I purchase one of these, I will be able to figure it out. The Green Elephant Popup Utilitent. In looking information about these shelters, one factor that I see that might be important is how opaque the fabric is. Some of these shelters seem to be made of material that allows light to permeate, potentially decreasing the level of privacy actually being experienced by users of the shelter. For that reason, a shelter that is made of darker material and/or two layers of material – such as the Partysaving version – might be preferable in at least some circumstances. t also looks stable enough that it might support the weight of the bag of a small solar shelter – something that would be disastrous for the previously discussed shelters. 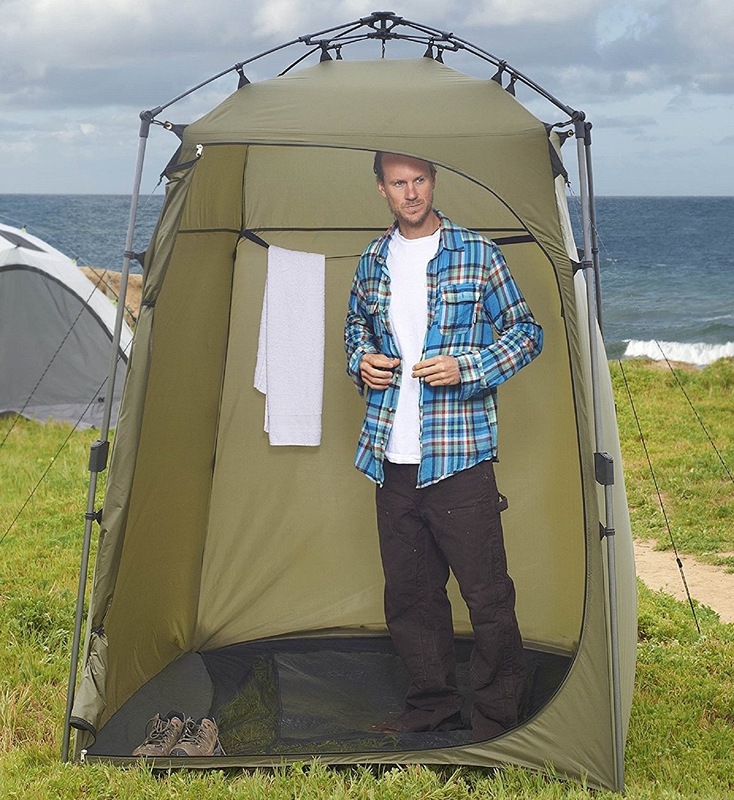 Another apparently sturdier privacy shelter is the KingCamp Oversize Easy Up Dressing Tent. 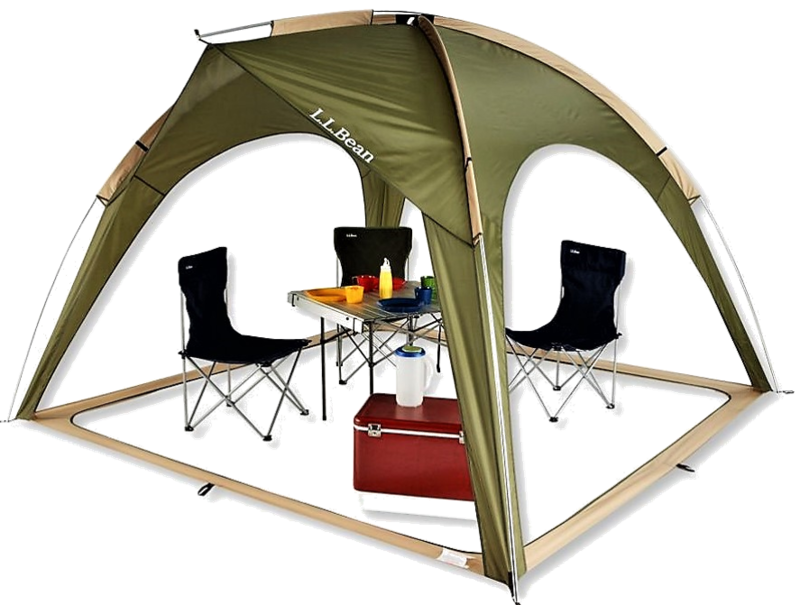 It sets up with poles like a tent and then folds down reasonably compactly (26″ x 6″ x 6″) for storage. VanDwelling guru Bob Wells put up the Texsport Instant Privacy Shelter in the Cheap RV Living video on shower enclosures, and it also looks pretty solid. 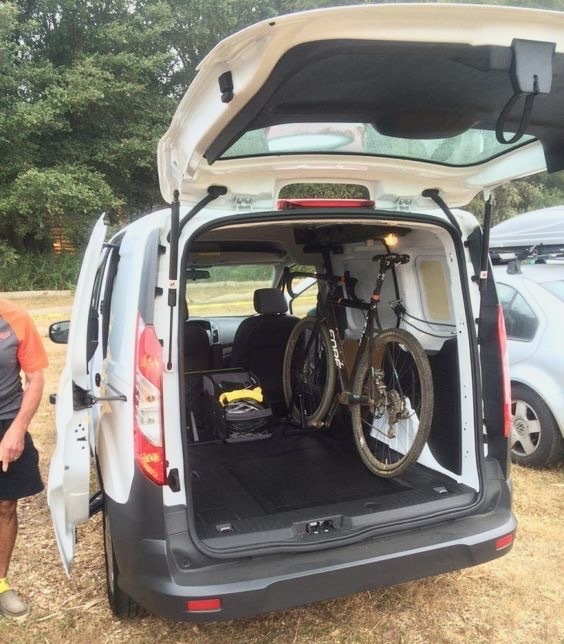 An opened real liftgate door of a Ford Transit Connect cargo van seems to have potential as the basis for a shower shelter. Some of the other discussion in that particular video has me thinking that since the rear door of my Ford Transit Connect cargo van lifts high into the air, probably I could clip a tarp to the edges of it (to serve as a shower curtain) and then use the makeshift shower stall with a pump-operated shower. My feeling on this is that if I didn’t want the ground area in back of my van to get really wet, I could stand inside one of my plastic storage containers while showering and then dump the water elsewhere after I was done. 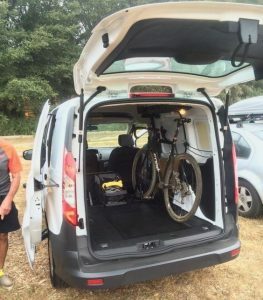 As described in the video, a van with fold-out doors also would work with regard to rigging up a shower right in back of the van, with just a couple of extra supplies required. Probably I will give this idea a try sometime soon, since it sounds like it would be lot less trouble than using a separate shower shelter that I would have to carry around in the van. Wolfwise Pop-Up Shower Tent. $30. Partysaving 6 Feet Portable Privacy Popup Room. $31. KingCamp Portable Pop-Up Privacy Shelter. $43. Green Elephant Popup Utilitent. $50. Cabelas Copper River Fold A Privy. $70. KingCamp Oversize Easy Up Dressing Tent. $95. TexSport Instant Privacy Shelter. $96. 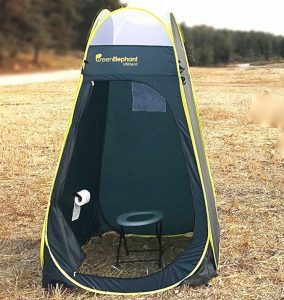 Lightspeed Outdoors Privacy Tent. $110. Grizzly Tarp, 9′ x 12′. $15. Megadeal Heavy Duty Spring Metal Clips. $7. CMS Magnetics Ceramic Magnets. $13. I have camped mostly in the desert and have found the standard lighter-weight tent stakes that have come with my tents to be wholly inadequate with regard to being able to be pounded into the hard dry ground. Heavy steel tent stakes have worked much better for me. Some people say they have resorted to cement nails – such as apparently are available at stores like Home Depot – for that purpose. Having a decent mallet to pound the stakes into the ground is also essential for camping, and this is the kind of thing that is easy to leave behind at the campsite. After one bad experience where I lost my mallet, I started carrying around a spare mallet (as well as some spare stakes). 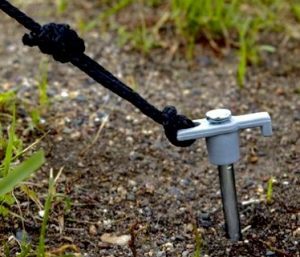 Bungee cords, guylines and ropes may be used to secure tarps or other camping structures and also may have a variety of other camping uses. Some people camping in rainier areas have reported that a trowel (a small shovel) has been helpful to them in terms of redirecting water away from their campsite. Finally, recently I noted on eBay a company called CampCovers selling footprints made of Tyvek for a wide variety of tent styles. (A “footprint” is a piece of material that goes underneath the tent, to protect it from wear and tear as well as possibly from mold growth). I always have purchased matching footprints for my tents when they have been available. However, these CampCovers footprints are much lower priced than the tent footprints that are designed to go with most tents, and possibly they would be better since they likely would not include any fire retardants. 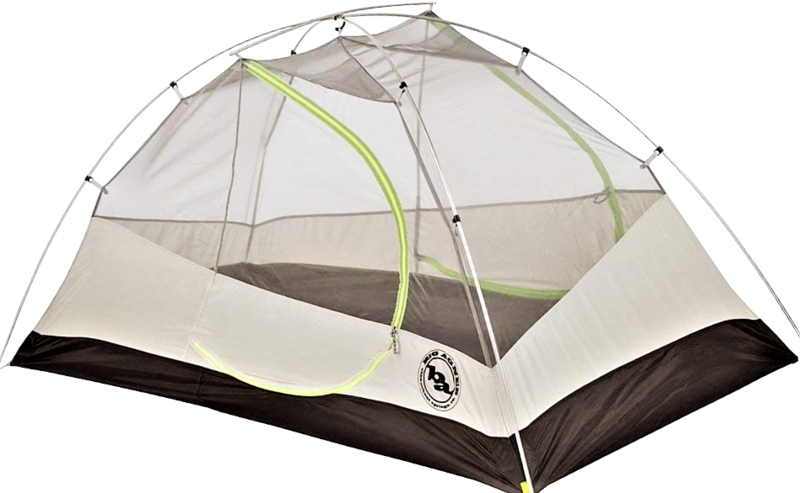 I am planning to buy one of these for my Sierra Designs Tensegrity Elite Tent (which does not have seem to have a footprint available for it), to see what I think. Coleman Tent Stake Mallet. $7. SE Steel Tent Stakes. $13. 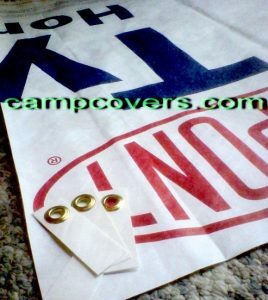 CampCovers Tyvek Tent Footprints. $14+.